Lately we’ve seen a lot of promotions offering bonus points for using various express checkout options, like Apple Pay, Chase Pay, and Visa Checkout. Now American Express has come up with a promotion for their Amex Express Checkout program. 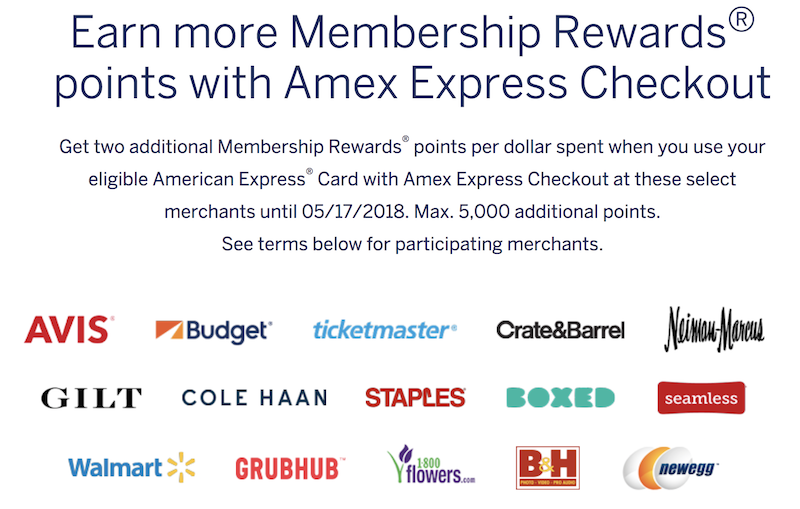 Specifically, those with eligible cards can earn two additional Membership Rewards points per dollar spent using Amex Express Checkout at participating merchants through May 17, 2018. 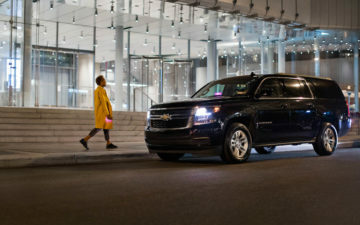 Through this promotion you can earn a maximum of 5,000 bonus Membership Rewards points during the promotion period, meaning that this is available for up to $2,500 of spend. Amex Express Checkout is a way for cardmembers to use their American Express account login credentials to quickly and securely check out with some merchants, rather than having to enter their credit card information every time. Eligible merchants for this promotion include 1-800-Flowers, Avis, B&H, Boxed, Budget, Cole Haan, Crate & Barrel, Gilt, Grubhub, Neiman Marcus, Newegg, Seamless, Staples, Ticketmaster, and Walmart. As of now this is only available for online purchases, where you should see the Amex Express Checkout option when finalizing your purchase. Anyway, I wouldn’t go out of my way to make any purchases through this promotion, though if you’re shopping with one of these retailers anyway then you might as well pick up some bonus points. There’s a potential stacking opportunity here. Some members have been offered an additional Membership Rewards point for purchases at Grubhub. 4 points per dollar isn’t bad if you intend to order food anyway. Does using Amex Wallet ever interfere with redeeming Amex Offers? Wouldn’t 2 “additional” membership rewards points be a total of 3 MR points per dollar? I tried using this with my platinum card and almost made the purchase with MR points….Be careful! @Dave I can confirm I’ve gotten the Boxed Amex Offers when using Amex Checkout! You know, the other day I was just thinking that we unfortunately only have Apple Pay, Android Pay, Walmart Pay, Chase Pay, CitiPay, MasterPass, and an in-app payment system for basically every business out there. My mobile wallet isn’t full enough, so thanks AMEX for adding another one to the mix. I think until I have 15 different options to pay for things, I won’t truly feel like I’m living in the digital age. Can I stack this offer with the Chase Sapphire shopping portal but paid with the Amex card? Looking at the Neiman Marcus offer in particular. Chase offers 3x UR points but paid with the Amex Checkout for the additional 3x MR.